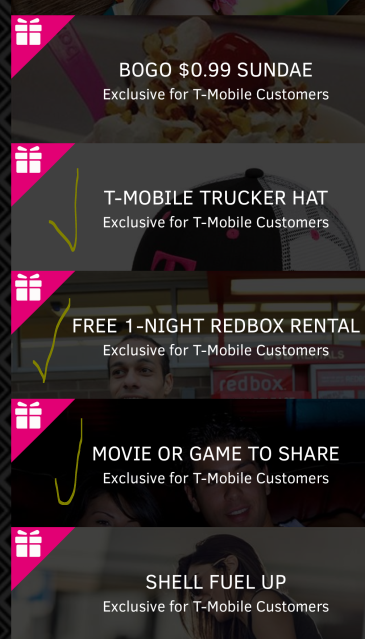 June 6 in 2017 looks like a pretty good haul for T-Mobile customers that are participating in their weekly freebie promotions! You get three freebies and two coupons! The freebies are one physical good (a T-Mobile branded Trucker Hat you can pick up at your local T-Mobile B&M stores) and two digital. The digital freebies are single-night coupons for Redbox for FREE movie or game rental. Technically one is for you, and one for a friend, but your “friend” can be yourself 🙂 You can use them to rent a movie or a video game. The first night is on them. If you don’t return it, you’ll be charged for every additional night. So a credit card will be needed for the rental even though the first night is FREE. 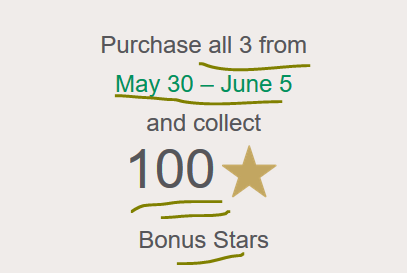 If you happen to enjoy or buy regularly the following items, this new promotion running for Starbucks Rewards members (YMMV; must manually activate it first) will get you 100 Bonus Stars (that’s 80% towards a reward) when you purchase one item from each participating product category between May 30 an d June 5 in 2017. You can only get one 100 Bonus during this promotion. If you buy more of these trios, you will not earn additional 100 bonuses. But you will continue earning the standard rewards (2 Stars per $1). If you are looking for refined coconut oil, and you like the Crisco brand, we have good news for you. They too have jumped on the coconut oil bandwagon and they are offering their 27 oz organic refined coconut oil for $7 through Prime Pantry. It averages 4.2 out of 5 based on 37 customer reviews. PS: if you are buying this, don’t forget to combine it with the Buy Five and No Rush Credit promotions for Prime Pantry. This one is not a Prime Pantry offer, but as of the time of writing it is marked as an “Add ON” item, which means you must place a $25+ order in order to buy it. The restrictions applies to all customers, including Prime members. The good news is that you can get to $25+ even if you just buy multiple quantities of this item. “This item” being a 100pk of Yorkshire Tea Bags for $5.49,. That comes out to around 18 tea bags per $1, which is pretty good! Yorkshire is one of the more balanced of the classic “English” teas. It averages 4.4 out of 5 based on 200+ customer reviews. Definitely better than the standard Lipton 100-packs (but taste is subjective regardless). If you like gunpowder green tea, especially if you like to mix it in other teas or make iced teas or Moroccan Mint tea or for cosmetic or other purposes, there is a sale at the moment at Prime Pantry on One Pound of Davidson’s, that’s 16 ounces, for $8.14. That’s around 50c per ounce, which is bang for the buck for loose leaf tea. You can combine this with the Buy Five promotion and/or any $5 “No Rush Credits” you may have for better savings. If you have a Prime Pantry No Rush Shipping store credit that is about to expire soon, and you want to stock up on Prime Pantry type of supplies, there are some good options for the Buy Five Free Shipping promotion at the moment of products you can use (or even donate) easily. 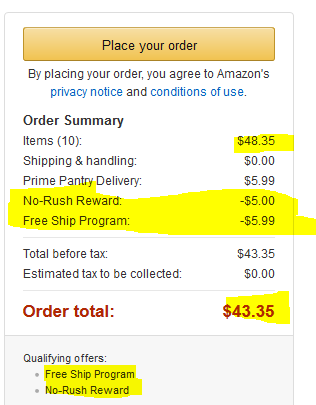 By combining the two offers, not only you don’t pay the $6 shipping fee for the Prime Pantry box, you also get $5 off from the “No Rush Credit”. It includes Nature Valley breakfast bars, some Lara Bars, Hefty trash bags, Planters and Amazon’s own Happy Belly nuts and trail mixes, ultra smooth Dove soaps, Listerine, 100pks of Lipton black tea bags ($3 making it 3c per tea cup), and many more! Amazon is making a big push to make itself a destination for fashion (it is taking them longer to make in-roads than they did with other product categories), which is why they offer free returns on clothing purchases for example. One such attempts to make progress is a new Father’s Day sale featuring a variety of clothing related gifts of utilitarian (and not) purpose. A variety of well-known brands are participating in this sale, including IZOD, London Fog, Armani, Littlefinger (oops, I mean, Hilfiger), Buffalo and more! Nearly 200 individual products are participating. Oops! I forgot to post this earlier in the month! The Samsung Book Deals for May 2017 are running, good until the last day of the month. As with before, you can pick one of the four available ebooks for FREE! Make sure the price shown is $0.00, otherwise you will be charged for it! Some Samsung devices have this offer only for a limited time (eg 12 months after purchase), some devices are NOT eligible, while other devices are eligible for the lifetime of the device. Regardless, all the ebooks offered through this are available through Kindle Unlimited as well, so you have another option to read them (if you are a KU subscriber that is). The ebooks offered here are all previously released ebooks and they have plenty of reviews already in the Kindle store, so you can use a long list of reviews and ratings and comments to make your decision. Samsung Book Deals is different from the Kindle First program which only offers pre-release ebooks (most of which ends up in Kindle Unlimited as well). If you find yourself running out of baseplates during your LEGO creative adventures, we have good news for you! The green baseplate (10×10 inches or 32×32 Lego studs) is on sale for a limited time for $6.79 each, in new condition of course, at amazon.com. Limit up to seven units per customer during this limited time promotion. It is a solid product judging by the reviews, it has 4.6 out of 5 based on over 640 of them. If you don’t object to buying used Grills and Outdoor Cooking type of products, we have good news for you! As part of the Memorial Day weekend festivities, Amazon Warehouse Deals (Amazon’s Used products sub-company) is having a 25% off sale on over 1600 products in these categories. There’s no coupon code to enter, the sale is reflected in the prices you see at their website! This is a limited time promotion but they did not mention when it expires. The T-Mobile Tuesdays for May 30 in 2017 has a Wonder Woman movie release theme! 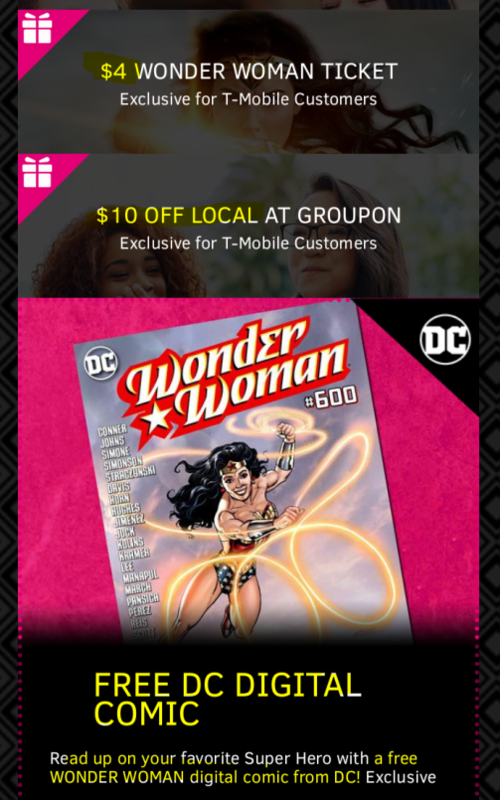 You get one FREE “Wonder Woman” digital comic book from DC, along with the option to buy “Wonder Woman” movie tickets for $4 each (instead of regular price). Details on which movie theaters or movie ticket purchasing services are participating will likely get revealed when the offer goes live. In the past they have offers with Fandango, so they could be the one (only a guess though!). 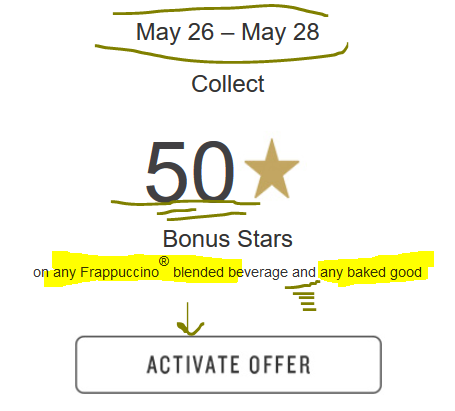 If you are a Starbucks Rewards member, especially if you also participating in the Before 11am Dash, there is a new promotion rolling by email, you get 50 Bonus Stars if you purchase any frapp TOGETHER with any baked good in the SAME transaction. The offer runs May 26-28 in 2017. You must manually activate the offer by clicking on the appropriate place in the email or app. Good news if this is your favorite combo, you can take advantage of this offer as many times as you like during this promotion which runs for three days. If you like Peet’s Coffee, more specifically shopping from their website, until May 29 (2017), coupon code FREESHIP17 gets you free shipping without a minimum purchase amount required. This happens only a few times a year, so it’s a good opportunity if you want to make a small purchase or scoop up something on clearance or sale that wouldn’t normally qualify for free shipping. If you are participating in the Plenti rewards program, check your account or your Plenti emails! 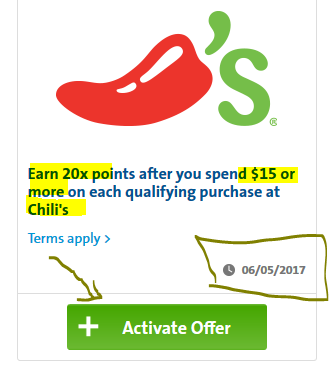 There is a new promotion for Chili’s restaurants that gets you 20% back in Plenti points on a qualifying purchase of $15+. It is important to understand what qualifies and what doesn’t. If you are not familiar, check the details in the promotion over there. For example, tips and alcoholic beverages are NOT eligible. You must manually activate this offer. Plenti has two kinds of offers: some are Automatic, so you don’t have to manually activate it, you just buy whatever is eligible. Others, like this one, must be activated first. Activation sounds more complicated than it is, you just click the green button as outlined in the screenshot below.